Robometricschool. - This is one of the big power amplifier using TDA7294 IC that will give you best experience using this IC. In this time we will give you global description about 100W Audio Amplifier using TDA7294 IC like the circuit schematic, component list and description. 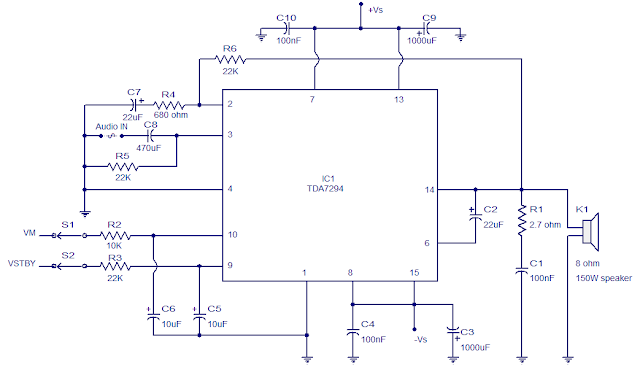 This is one circuit schematic of 100W Audio Amplifier using TDA7294 IC. According Circuitstoday site describe that TDA7294 is an integrated, monolithic, Class AB audio amplifier designed specifically for Hi-Fi applications. The IC has a DMOS output stage and can deliver 100W RMS into an 8Ohm speaker at +/-38V dual supply. The TDA7294 has low noise, low distortion, good ripple rejection and can be operated from a wide range of supply voltages. The IC has built in short circuit protection and thermal shutdown circuitries. The IC is available in multiwatt 15V and multiwatt 15H packages. In the circuit TDA7294 is configured to provide 100W output power into an 8Ohm loudspeaker at +/- 38V supply. C8 is the input coupling capacitor and the input is applied to the non-inverting input (Pin3) of the IC. C3 and C9 are power supply filter capacitors while C10 and C4 are bypass capacitors. C2 is the bootstrap capacitor. RC network comprising of R1 and C1 improves the high frequency stability of the amplifier and also prevents oscillations. R2 and C6 sets the mute time constant while R3 and C5 sets the standby time constant. S1 and the mute switch and S2 are the standby switch. R5 is the input resistance and the amplifiers input impedance has a direct relationship to its value. R4 and R6 is used for setting type closed loop gain and with the used value, gain is 30dB. C2 is a feedback capacitor and it also provides DC decoupling.